Added by Akan Nkweini on May 31, 2018. The leadership and membership of Mboho Mkparawa Ibibio hereby announce the sad and untimely passage of the 9thInternational President of Mboho Mkparawa Ibibio, Akparawa (Elder) Monday Jimmy Etokakpan, FCIL, JP which sad event occurred on Wednesday, April 25, 2018. 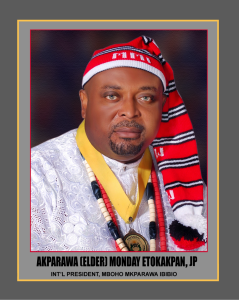 Late Akparawa Elder Monday Etokakpan a.k.a MOJE was born on 16thDecember, 1968 in Ikot Okpon, Edebom1, Nsit Ibom Local Government Area of Akwa Ibom State. Until his demise Akparawa (Elder) Monday Jimmy Etokakpan was also Senior Special Assistant to the Executive Governor of Akwa Ibom State on Tourism Development. He had previously served as Chairman Caretaker Committee Nsit Ibom LGA as well as Chairman Akwa Ibom State Environmental Protection and Waste Management Agency among other public offices. The late President attended St. Saviour’s African Primary school, Edeobom1 for his First School Leaving Certificate in 1980. He thereafter went to Salvation Army High School Efa, in Etinan and obtained the West African School Certificate in 1985. Following the death of his father during his early childhood and later the sudden death of his mother barely a year after completion of his secondary education, Akparawa (Elder) Monday Etokakpan, like every other siblings of his, took a forced break from education. But being a man who would never bow to adversity he pulled down the huddles and eventually, through self-help efforts, he managed to proceed to the University of Calabar from where he obtained an Ordinary National Diploma in Business Administration in the year 2000. He then went to Akwa Ibom State Polytechnic, Ikot Osura to study for a Higher National Diploma in Business Administration which he completed successfully in 2003. His quest for higher education took him to the University of Uyo, where he studied and obtained a Post Graduate Diploma in Business Administration (PGBA) in 2006. Akparawa Etokakpan did not stop there as his continuous search for knowledge took him to Japan in 2012 where he participated in a group training in The Implementation of the INTO Agreement. He also was certified a Fellow of Chartered Institute of Leadership, (FCIL). Monday Etokakpan had worked in a number of construction companies between 1987 to 1994 when he incorporated his own company MOJE and Sons Limited. He did serve as a Personal Assistant to Qua Iboe Church National Conference Chairman between 1997 and 2003. Montyhad also been an international representative of Quest Net Malaysia since 2008. Elder Monday Etokakpan was born into a God fearing family where the parents worshipped with Qua Iboe Church. He was trained with Christian values which helped him to grow up as an obedient, humble and respectful child in his community. He was baptized based on the doctrines of Qua Iboe church at his teenage and joined the church choir which he grew into becoming a choir leader. Elder Monday Etokakpan was a choirmaster QIC Barracks Road, Calabar, Cross River State, Assistant Choirmaster QIC 165 Aka Road, Uyo. He was a song Writer and Composer. In the vineyard of God he distinguished himself so well that the Elders of Qua Iboe Church saw him fit to become an elder when they unanimously agreed to ordain him an Elder of Qua Iboe Church in 2008 at the youthful age of 40, the office in which he served till death. He was also an influential member of the Organizing Committee of the record-setting AKSG 9999 Xmas Carol Group. He was a Jerusalem Pilgrim. Akparawa Elder Monday Jimmy Etokakpan was a good mixer and a philanthropist who was always willing to starve if necessary in order to make others happy and these rare qualities accounted for his wide acceptance everywhere he went. Among many groups he belonged is the foremost Ibibio Socio-cultural Organization Mboho Mkparawa Ibibio where his leadership qualities saw him progress rapidly through various ranks as Deputy Secretary General (2003-2006), Vice President II (2006-2010), Vice President I (2010-2014) and ultimately the International President MMI, in 2014 until his death. Worthy of note is that he was just two months away from the end of his tenure in July as the International President when he had to respond to the ultimate call. Akparawa Elder Monday Jimmy Etokakpan was honoured with the traditional chieftaincy title of Obong Nkaiso Nsit Ibom by Nsit Ibom traditional stool and subsequent appointment into the Nsit Ibom Traditional Rulers Council since 2003. Obong Monday Etokakpan single-handedly sponsored a community-based football tournament tagged, Edeobom 1 Unity Cup for many years which was indeed a unifying platform bringing the youths of his community together. He was recently inducted an Associate Member of Atti Annang Socio-Cultural organisation. According to a joint release by his family and Mboho Mkparawa Ibibio his funeral programme started on Tuesday, 29thMay, 2018 with the formal opening of the funeral home at Ikot Okpon, Edeobom1. There will be a Service of Songs at the International Headquarters of Mboho Mkparawa Ibibio along Udo Udoma Avenue, Uyo, Akwa Ibom State on Wednesday 30thMay, 2018 at 5:00pm. At 7:00 a.m. on Saturday, 2ndJune, 2018 Mboho Mkparawa Ibibio will convene a Special General Assembly in Ibibio Hall of Udo Udoma House, Headquarters Complex of Mboho Mkparawa Ibibio, Uyo where his remains will lie in state. A funeral Service at Comprehensive Secondary School, Edeobom1, Nsit Ibom LGA will hold at 10:00am to be conducted by Qua Iboe Church, Afaha Offiong Suprentendency. Interment will follow thereafter at his country home, Ikot Okpon, Edeobom1, Nsit Ibom LGA. May his soul rest in perfect peace.